As many in the Diocese know, I’ve made the issue of Medicaid Expansion a priority over these past two years. I’ve lobbied legislators, I’ve written statements, I’ve offered speeches, I’ve spearheaded full-page newspaper ads and I’ve gathered the support of 111 fellow clergy from throughout the Utah faith community. Medicaid Expansion is a program where the legislature can accept 670 million dollars that the federal government has offered to give Utah. This would fund health care for 123,000 of our neighbors who otherwise can’t afford the care. Governor Herbert has tried to trim it down and rename it as “Healthy Utah” to make the legislature accept at least some of the money. As you can see from news reports—many legislative leaders have turned a cold shoulder to the plan—and in my opinion they have also therefore turned a cold shoulder to our neighbors in need. Healthcare for all is a fundamental and cherished core value of our Diocese since it’s beginning. It was what Bishop Tuttle fought for starting in 1867. Bishop Tuttle sealed us as a people dedicated to healthcare for all when others wouldn’t act. The voiceless in his time could only revert to home remedies. On April 30, 1872, St. Mark’s Hospital opened at 500 East and 400 South with six beds and an unpaid doctor. The Episcopal Church charged a dollar a month for health care. Bishop Tuttle proclaimed—quote “ we shall never refuse admission” to the hospital if one couldn’t afford the dollar. Last year, we gave about two-hundred thousand dollars through our Trust Two account—our perpetual indigent medical care fund—to make sure at least some of the voiceless people could receive healthcare. We help support the free clinic in Moab. We have offered health services to our neighbors on the reservations. We have offered health services to our neighbors we discover in our cities. We offer health services through mental wellness for our youth in Ogden with their safe after-school program Youth Impact. However, in today’s environment, we are just part of what can be done. Salt Lake City alone has grown from 12,000 in Bishop Tuttle’s days to a metro area of nearly two-and-a-half million. With nearly 130-thousand in poverty, the goal of healthcare for all seems unreachable. But, the Federal Government offered to make an amazing gift to bring healthcare with dignity to those who live with the burden of poverty. Yet, our legislature appears committed to ignore the voiceless. 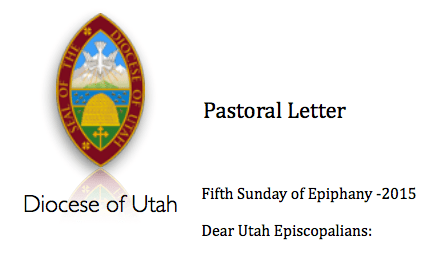 Just as Bishop Tuttle did, I am compelled as your Bishop to reach out. He directed us then. I honor his compassion, his vision, and his courage now. I ask that you, your neighbors, your family, and your congregation have a conversation about healthcare for all and our heritage as Episcopalians. I ask that if you feel Bishop Tuttle’s directive that “we shall never refuse admission” to healthcare is still valid these nearly hundred-fifty years later, then I ask you contact your legislative representatives. It takes courage. I believe it takes the courage the Lord gives us as Christians. It will be difficult to change minds, but it can be done. You can email your representative. Please make sure you put in the subject line of the email that you are a constituent of that particular representative. Our friends at the Coalition of Religious Communities tell us emails are the best way short of a personal visit. You can tell him or her that you too are driven by the words “we shall never refuse admittance” to healthcare for all and that you support Governor Herbert’s Healthy Utah Plan. You will be giving voice to our neighbors, our families, and you. This is one issue where we are all in it together.